Neal Carter is the Course Manager at Chipping Norton Golf Club. He has just completed trials of a range of probiotic dressings for greens to test the effectiveness of single, multiple and combined applications of the products. Supplied by ORM Professional Products (Brecon) Ltd, these totally organic materials resulting from the natural functions of earthworms, have no chemical additives and are entirely safe for staff, players and wildlife. When asked why he had agreed to the trials Neal replied "We have all heard of throwing everything including the kitchen sink at a problem, but when I was Course Manager at Addington Golf Club, it seemed the kitchen sink was the problem. 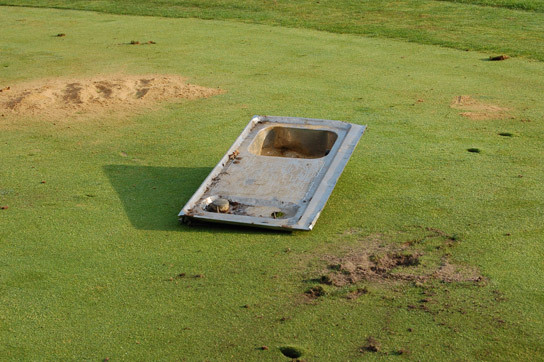 Vandals had not only caused severe damage to several greens but had also left a rather bizarre memento." "I suppose it made a change from the ubiquitous shopping trolley" continued Neal "But removing the sink was the easy bit, repairing the green caused more of a headache. We tried all the usual remedies, including spraying, aerating and re-seeding but these proved only short term solutions. What we needed was something to kick start and promote strong root growth. We found the answer in the form of an organic, probiotic material called Vermi-T.
Clive Pearson Sales Manager for ORM Products recommended the Vermi-T to Neal after an impromptu visit to the club. "I believed that the Vermi-T would help" said Clive, but it is always difficult to convince anyone to try something new, particularly when it is considered an 'alternative' remedy. However, having tried everything else (including the kitchen sink!) and failed to make significant progress, Neal agreed to apply the product and the results justified his decision. "We had root growth within a few weeks, the patched look faded as the strong, healthy grass took a hold. The claim that nutrients already present in the soil would be released to work their magic, certainly appeared to be true. We were able to reduce the amount of fertiliser we used over a period of time, roots became deep and well established, thatch fungus all but disappeared and the green was lush and healthy. So when I moved to Chipping Norton, with several turf maintenance issues of its own and Clive asked me to take part in trials I was very happy to oblige." "The results of the trials to-date have been extremely successful" said Clive "and now with soil association approval, we are very positive that the benefits of these incredibly effective, natural materials are gradually receiving the recognition they deserve."